Fisher Space Pen Co., a family-owned company manufacturing Made in America products, celebrates the 50thAnniversary of the maiden flight of its iconic AG7 Original Astronaut Space Pen aboard NASA’s Apollo 7 Mission on October 11, 1968. The company was recently featured on ABC World News Tonight with David Muir’s “Made in America” series. Watch video. To commemorate this historic occasion, Fisher Space Pen is issuing a Limited Edition – AG7 Original Astronaut Space Pen and Coin Set. The pen’s barrel is made of brass with gold titanium nitride plating and an engraved design featuring a constellation and the Apollo 7 capsule. The set is accompanied by a beautifully-designed coin featuring the Apollo 7 capsule on one side and the Fisher Space Pen “50” logo on the other. 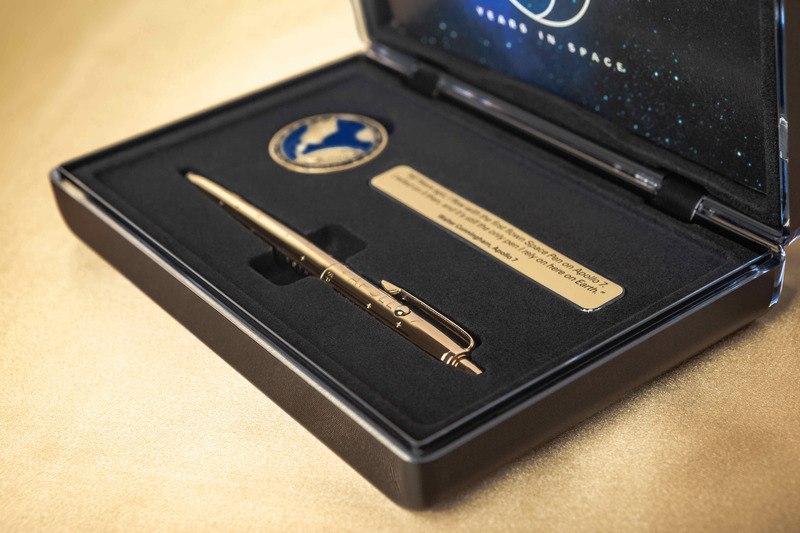 The set is complemented by a plaque engraved with a quote from Walter Cunningham, Lunar Module Pilot on the Apollo 7 Mission: “50 years ago, I flew with the first flown Space Pen on Apollo 7. 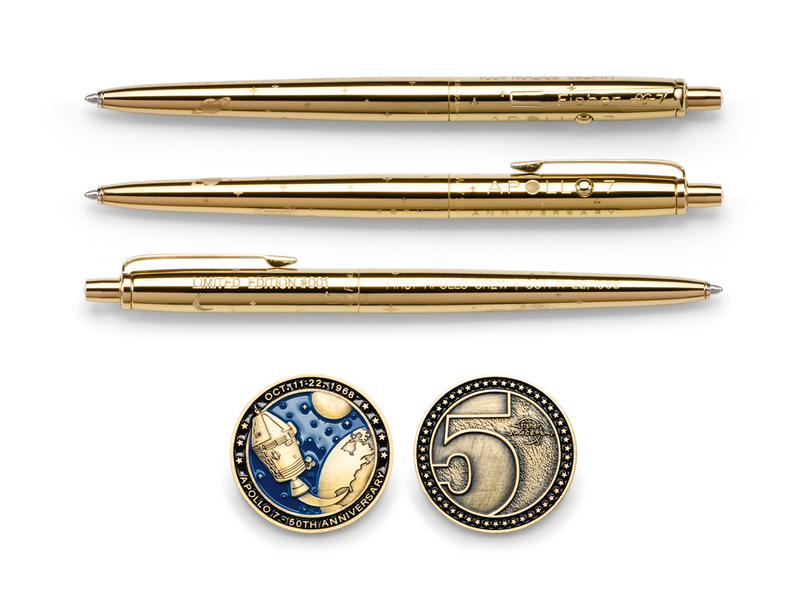 I relied on it then, and it’s still the only pen I rely on here on Earth.” Click to purchase your Limited Edition Fisher Space Pen and Coin Set. The Apollo 7 Mission is a historic firstin many respects: It was the first manned space flight of NASA’s Apollo Program; the first time a Saturn IB vehicle flew into space; the first three-person American space mission; the first space mission to include a live TV broadcast from an American spacecraft; and the first time astronauts began using the newly-developed Fisher AG7 Anti-Gravity Space Pen. After spending over $1 million dollars of his own money and years of research, Fisher finally developed his patented pressurized ink cartridge that keeps solvents from evaporating and allows ink to flow in zero gravity. The Fisher Space Pen writes upside down, under water, in extreme temperatures from -30 to +250 degrees F (-35 to +121 Celsius), over almost any surface and three times longer than the average pen. Watch: “How It’s Made” video. Paul Fisher sent samples of his prototype to Dr. Robert Gilruth, Director of the Houston Space Center. The prototypes were thoroughly tested by NASA and passed all tests. 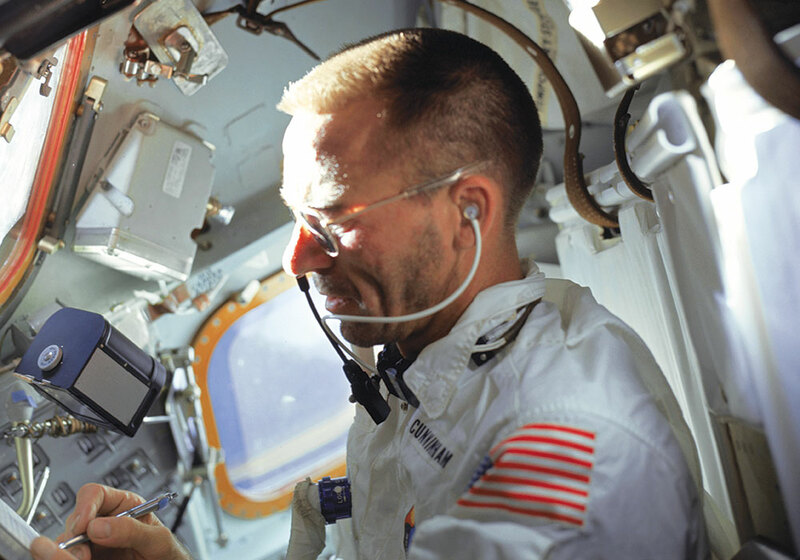 NASA astronauts began using the Fisher AG-7 Anti-Gravity Space Pen aboard the Apollo 7 Mission and Fisher Space Pen has been used on all manned space flights since, including NASA’s Space Shuttle Program missions, the Mir Space Station and the International Space Station as well as the Russian and Chinese space programs.